The Royal Ontario Museum (ROM) and Parks Canada have launched their Burgess Shale on-line exhibition, as part of the Virtual Museum of Canada. The website provides, for the first time ever, an immersive journey into the world of the bizarre prehistoric creatures that formed the foundation for all animal life on Earth half a billion years ago. The Burgess Shale history book is composed of multiple sections that will give you a complete understanding of the Burgess shale, it's significance and a few other topics of interest. "...and a few other topics of interest"... knowing how difficult it is to write about truly majestic things in nature when human words are often not enough, that end of the sentence still makes me smile. Burgess Shale truly is one of the greatest divine Nature Reserves on our planet - a rare geological formation that God has protected from erosion and tectonic destruction so that we modern humans can admire the morning of the Creation of Life on planet Earth and praise Him for the wonders of Nature. 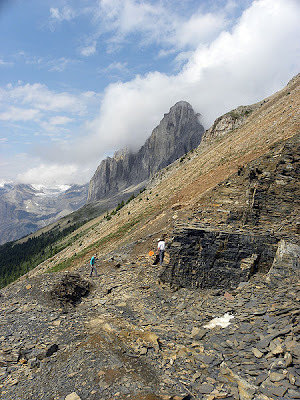 The fossiliferous deposits of the Burgess Shale correlate to the Stephen formation, a collection of slightly calcareous dark mudstones, about 505 million years old. The beds were deposited at the base of a cliff about 160 m tall, below the depth agitated by waves during storms. This vertical cliff was composed of the calcareous reefs of the Cathedral Formation, which probably formed shortly before the deposition of the Burgess Shale. The precise formation mechanism is not known for certain, but the most widely accepted hypothesis suggests that the edge of the Cathedral Formation reef became detached from the rest of the reef, slumping and being transported some distance — perhaps kilometers — away from the reef edge. Later reactivation of faults at the base of the formation led to its disintegration from about 509 million years ago. This would have left a steep cliff, the bottom of which would be protected, because the limestone of the Cathedral Formation is difficult to compress, from tectonic decompression. This protection explains why fossils preserved further from the Cathedral Formation are impossible to work with — tectonic squeezing of the beds has produced a vertical cleavage that fractures the rocks, so they split perpendicular to the fossils. The Walcott quarry produced such spectacular fossils because it was so close to the Stephen Formation — indeed the quarry has now been excavated to the very edge of the Cambrian cliff. The Stephen Formation is a middle Cambrian unit exposed in the Canadian Rockies of British Columbia. It is famous for the exceptional preservation of soft-bodied fossils: the Burgess Shale biota. 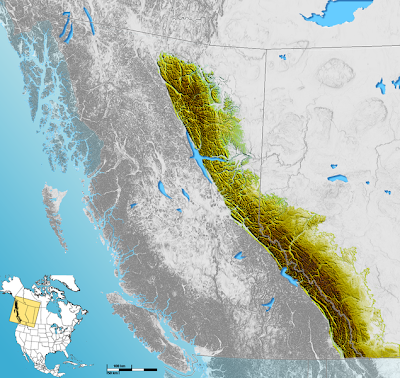 The formation is made up of the Kicking Horse member, which includes the Alalcomenaeus–Sanctacaris beds; this underlies and interdigitates with the unfossiliferous Yoho River member. These two are truncated by an unconformity and covered by the Campsite Cliff member, which contains the Ogygopsis beds. The Wash member, which contains many shelly but no soft-bodied fossils, interrupts this sequence in places, and directly underlies the Phyllopod beds, which mark the base of the Walcott Quarry member. This underlies the Wapta member, which is unconformably overlain by 'Tokumm'. The Wapta member has been redefined into the Raymond Quarry member, Emerald Lake member, Odaray member, Paradox member and Marpole member. The thin Stephen grades conformably into the overlying Eldon formation. Such is the daily work of Mr Adam, the Geologist - identifying and giving names to things that God has made using our human languages from Native American Yoho and Wapta to Greek Paradox! To truly understand the setting of the Burgess Shale we also need to take a look at the geological history of the majestic Canadian Rockies with its highest peak Mount Robson reaching 3954 m above sea level. There are many online sources that help us to explore this folded edge of North American continent. Start your study, for example, with wikipedia which is freely available in so many languages.